The War of Turkish Liberation: After their defeat in World War I, the Ottoman Empire was in ruins. 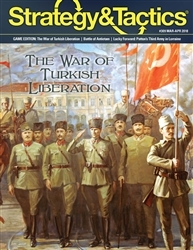 In May 1919, Turkish nationalist forces would find themselves in a war for independence. Battle of Antietam: The Battle of Antietam is remembered as the bloodiest single day battle in American military history. Often overshadowed by other famous battles in the war, Antietam was instrumental in enabling Abraham Lincoln to issue the Emancipation Proclamation. Lucky Forward - Patton’s Third Army in Lorraine: In the course of 280 days, the US Third Army blazed across Europe, liberating over 81,000 square miles of territory. From September to early December 1944, the Third Army fought a grinding campaign to push the German army from Lorraine.